Nonhuman animals communicate with sensitive observers all of the time. The dog yelps when hit by an abuser. And I knew a pig’s scream as he or she was hellishly ushered through a Toronto slaughter facility. I will never forget the time I accompanied my friend, Anita Krajnc, to one of her vigils at a pig killing plant. One scream of a hog floated in the air as hauntingly human-like, and sounded for all the world like that animal was outraged at being assaulted or murdered. What would nonhuman animals verbalize if we interpret from this sort of nonverbal communication, the yelp of the dog and the scream of the pig? I will write only a little bit of animals’ nonverbal communication translated into verbal communication in the quotation marks, freely using human words to make sense of their expressions. Although they cannot use words in this way, we must interpret them with all of our power. A deep listener looks not only at what someone is saying, but what they would say if they could. We do this if we are trying to help an immigrant who does not speak our language. We do not harshly interpret from them only what they actually say, but need to consider what they would say if they were able to through language ability. Similarly, when considering the mentally disabled, we consider what they would say if they were able in terms of intelligent functioning. Considering nonhuman animal interests should have the same constructive rules for listening. Or interpreting. 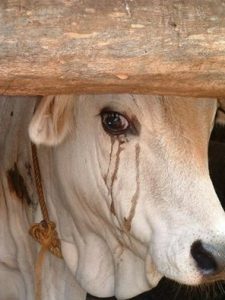 “Some speak of using us gently, but in those situations you will find us reacting in panic to humans killing us for food, for fur, and for leather. Gentle usage also typically means enslaving us for entertainment in what you call the circus, the aquaria, the rodeos, and the bull fights. We balk at slavery just like humans unless beaten into submission.” Compare human responses to serial killers of humans and animal responses to those who set out, trampling through the woods, to kill nonhuman animals for fun. The terror is there in both cases. 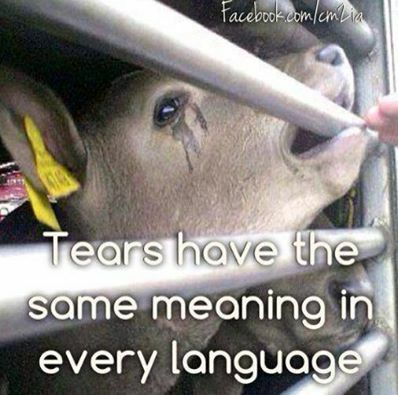 “Factory farming and vivisection cause us to react with tortured expressions, as humans would if abused in these ways.” About 95% of animals who die at human hands are killed for food.2 The interpreter will add that most animal uses exhibit the same mercy – or we should say ruthlessness – that occurs in the worst mistreatments of humans. It is the same quality of mercy that made the Holocaust not only possible, but actual, for many of my relations who were victims. “We are rational.” Humans were no longer defined as the tool-using animal in 1960 when Jane Goodall found out that chimpanzees fish for termites in tree stumps using branches. I have observed a rabbit drag over a cardboard box in her pen against the wall. It was evidently done, not by random accident, but deliberately, so that she could hop up on it to look through a peep hole near the top at her new rabbit neighbours. Betty the Crow astonished scientists in an Oxford University laboratory when the so-called “bird brain” bent a wire to drag a food bucket towards herself, away from a bullying cagemate of the same species who used to monopolize the food. She was not trained, environmentally determined, and there are no instincts for this set of highly sophisticated behaviours. This statement from the animals anthropomorphizes — projecting the human onto the nonhuman — in terms of animals’ expressiveness, but not concerning their reported experiences, for “we too have our own feelings, loves, friends and dreads. 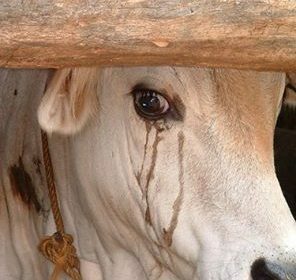 This may sound like a bit much to you, but we are merely being honest about how we perceive things from our end.” The interpreter will add that if humans were treated in everyday ways that animals are subjected to, you would not expect them to cover up how they are treated with violence. And you would not for a second hesitate to call it violence. “Will you open your minds to us? Will you open your caring to us? Everything we care about depends upon you, or others of your species, for we are thoroughly dominated by human beings. We appeal to you to care about our sufferings and to make allowance for the joys in life that we can also have, if only we are allowed to.” There is always more to say. Proud to be vegan and neither I buy any products made from animal skin. Even if God comes to me and ask to to murder and exploit any poor innocent soul in his name then I would live my entire life in hell after death rather than becoming a slave to my taste buds. Amen to that! The only authority is truth and most importantly moral truth – the objective morality of knowing the difference between right and wrong 🙂 Thanks for the comment.